The Haida Way is Port McNeill’s most popular Northern Vancouver Island accommodation. Located on Vancouver Island the Haida Way is within walking distance of shopping, the harbour and the ferry terminal to Sointula and Alert Bay. For your convenience, we offer a full-service restaurant, lively pub and well-stocked liquor store. Approved by BCAA and Tourism BC, the Haida Way's 70 cozy guestrooms and suites feature brand-new queen-size beds and free wireless internet. We'd like to show you our accommodations to give you an idea of what you can expect. 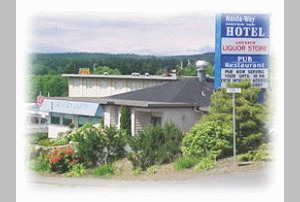 Please visit Haida Way Hotel Website.